The largest land offering in Washington state at over 10,000 acres, Ravenwing Ranch is a unique trophy property of vast spaces, open skies and endless possibilities. Nestled along the west side of the Columbia River, rolling hills and valleys give way to spectacular views with 1.25 miles of pristine river frontage. Brad Vancour, the listing broker with Realogics Sotheby’s International Realty, recently arranged for a group of Special Forces Military and a Wounded Warrior to visit and hunt on the property for an Outside Magazine feature that outlines the ways in which thoughtful hunting practices and population management are bolstering herd animal conservation efforts. Ravenwing Ranch is an unrivaled trophy property just a short 20 minute flight from Seattle. As the article describes, following sharp declines in herd populations in the early 20th century, William Temple Hornaday “a prominent zoologist, conservationist, taxidermist, and prolific author” began public conservation effort that, with the help of Teddy Roosevelt, grew into the North American Wildlife Conservation Model. This system “directs funds collected from hunters to habitat preservation, scientific study, and wildlife management” and provides an estimated $3 billion in conservation funds each year. Vancour joined the group for their last evening on the property as they camped out underneath the stars. He says that though the owner generally does not grant requests for hunting on the property, they made an exception in this case for the group’s commitment to the environment and their affiliation with the Wounded Warrior Project. “It was truly a pleasure to welcome them to this unrivaled trophy property,” Vancour added. Vancour (second from left) was all smiles after spending time with the visitors at Ravenwing Ranch. Situated in Wenatchee, the “Apple Capital of the U.S.,” Ravenwing Ranch offers over 60 acres of cherry and apple trees that produce approximately $350,000 in annual revenue, two residential homes, a sales center and a large storage facility. The lower section of the trophy property has preliminary approval for resort development, and is ready for the vision of its next steward. On May 25th 2017, an exclusive event was held at Misty Isle Farms, one of the largest and most iconic properties in Washington state. Located on Vashon Island, the urban ranch estate was founded by Thomas J. Stewart in 1978. Over the last forty years, Misty Isle Farms has expanded to encompass 525 acres across 44 tax parcels that embody Mr. Stewart’s aim to create a fully functioning gentlemen’s ranch filled with world-class landscaping within close proximity of Seattle. Today, the property has cemented a reputation as one of the premier arboretums in the Northwest with over 3,000 planted trees of 300 varieties from around the world. There are also over 300 different perennial plant varieties of shrubs and bushes, and a Rose Garden that is home to over 100 different rose varieties. The property boasts over 8 miles of walking and riding trails with six custom bridges to enjoy the scenery; a driving range with chipping and putting greens that adhere to PGA Standards, a Heli-Pad and Hanger, and a private 2,200-foot landing strip for planes. From the main residence, it is not uncommon to see black angus cattle in the pastures set against the backdrop of Mount Rainier. In its storied history, the ranch has served as an entertainment location for a variety of events; from smaller parties and fundraisers to groups of up to 8,000 people. For the May 25th Event, there was no shortage of things for the guests to see and do when they arrived at Misty Isle Farms. Guests were encouraged to walk the grounds and explore the various gardens; and to visit the 12,000 square foot showroom displaying vintage horse carriages. Once everyone settled in, well-known Seattle sommelier David LeClaire opened several key bottles from the wine cellar for guests to sample. The featured wines were from the 1970s, 80s, and 90s and included some of the best wines from France, Australia, California, and Washington. 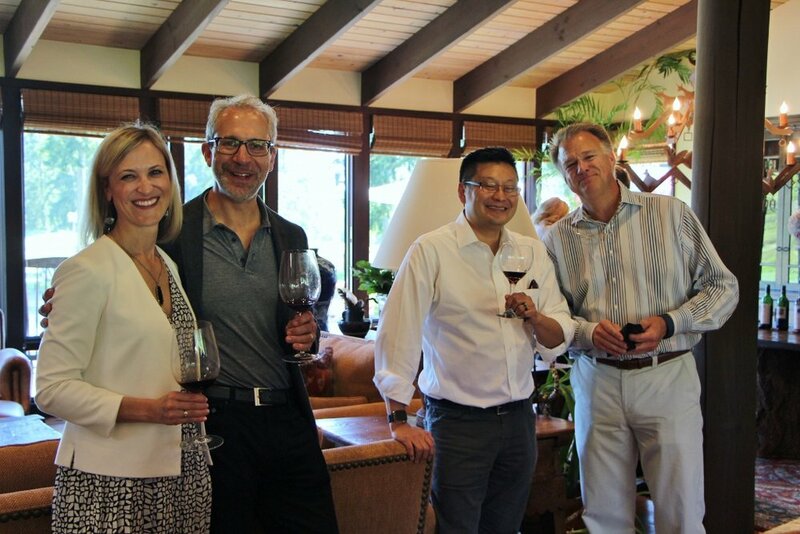 Opened vintage bottles included Chateau Lafite Rothschild, Chateau Mouton Rothschild, Chateau Haut Brion, Baron Henri Medoc, Penfolds Grange, Opus 1, Stags Leap, Silver Oak, Caymus, Kistler, Pride, Staglin Family, DeLille, Hedges, Quilceda Creek and others. Award winning Washington State wine makers Greg and Stacy Lill of DeLille Cellars based out of Woodinville, remarked on the impressive wine selection. International artist and art world celebrity Josée Nadeau recently completed a two week visit to Washington State where she completed 12 new brilliant original paintings. Many of the paintings were based on well known Washington State landmarks including Mount Rainier, the Skagit Valley Tulip Fields, Misty Isle Farms on Vashon Island and the views from Cave B Estate Winery and Resort of the mighty Columbia River. At the Cave B Resort, Josée experienced the great food and service offered at Tendril’s Restaurant, as well as the award-winning wines of the vineyards. Josée painted at different hours of the day, capturing the amazing dancing light on the canyons of the riverfront below, as seen from the Cave B Inn and the Private Villa. Other works of art on this trip included a stop in Ellensburg to paint a 2-year-old Arabian Colt from the world-renowned Equestrian Horse Breeding Center of Orrion Farms. In this masterful painting, Josée captured the spirit of the young stallion named “Cullinane”. She also toured the horse pastures and the grounds of this stately custom built 17,000 sf house, an amazing property in Eastern Washington. When she wasn’t painting, Nadeau attended many Seattle community and private events. Among her favorites was the Northwest Film Forum on May 3rd, where Nadeau presented to actor Tom Skerritt an original work of art painted specifically to honor him for of all the charitable work that Tom has done over the years for military veterans and the film industry. It was an epic evening, when on May 5th, Josée presented her Washington State Collection at the Realogics Sotheby’s International Realty Kirkland Office. This unique collection of works consisted of 6 new original paintings from her visit, and over a dozen early works of art created at the famed Sundance property owned by Robert Redford. Her earlier works presented at the show were mostly exclusive customized giclée prints on canvas. Among them, was a rendition of the Mona Lisa, that Nadeau painted in 2014 for the Bobby Kennedy Jr. fundraiser, the Waterkeeper Alliance Celebrity Gala. The highlight of this spectacular evening was experiencing Josée painting live to an audience of 75 select attendees at the Private VIP gathering hosted by the Kirkland Realogics Sotheby’s International Office. The event was quite an honor for the audience. Nadeau has been recognized for her talent of painting to music for crowds of over 1000, including painting for European royalty as well as celebrity tributes — including Dionne Warwick’s 50th year anniversary celebration at the Fontainebleau in Miami. Just prior to arriving in Washington State, Josée was in West Palm Beach, Florida paying tribute to Nelson Mandela by painting his image, while live on stage, in collaboration with the Footsteps of Peace. This was Josée’s 3rd time painting a tribute of Mandela since his passing. The first event, held at Riverside Church in New York City on Mandela’s birthday, was covered by CNN where, as the featured visual artist, she displayed her talent by painting live to legendary Opera Singer Simon Estes. High profile attendees in the audience included both United Nation and South African Delegates. Josée is also world renowned for her famous portrait of the legendary Olympic gold medalist skier, Stein Eriksen. This 8 foot tribute of Stein can be seen in the main lobby of Stein Eriksen Lodge, in Deer Valley, Utah, named the number one ski lodge in the world, two years running. Nadeau just got accepted by US Immigration as a permanent resident of United States under extraordinary talent in the field of the arts – the highest award given by U.S. Immigration and Government. This places Josée Nadeau at the level alongside of Noble Peace Prize winners, Oscar and Emmy category. To purchase any of Josée Nadeau’s art, please visit JoseeNadeau.com, or for more information, email info@joseenadeau.com. Please note that there was discussion with the owners of the Cave B Estate, Winery and Resort for Josée to develop an Artist Workshop, possibly later this summer at the Cave B Estate. Should this come together, we’ll let everyone know. Josée’s next event is working with Alison Eastwood and Frances Fisher for the 2nd Annual Art for Animals Fundraiser taking place in Los Angeles on June 4th. Details to available here. Josée Nadeau’s trip, schedule and accommodations were sponsored by Brad Vancour, Founding Member of Realogics Sotheby’s International Realty Kirkland Office. Nadeau’s history in the art world begins in the Giverny region of Europe, 40 minutes north of Paris. She spent ten years as a private guest of European art expert Gerald Van der Kemp and his wife, Florence, living in a private studio on the grounds of Claude Monet’s garden.